Image caption NDP leader Rachel Notley told supporters: "I think we might have made a little bit of history tonight"
A left-leaning party has won a surprise victory in Alberta, one of Canada's most conservative provinces. The New Democratic Party (NDP) ended the Progressive Conservatives' (PC) 44-year rule of the province. Political observers were stunned by the result, with one commentator saying: "Pigs do fly". Alberta's Premier Jim Prentice, a former member of Tory Prime Minister Stephen Harper's cabinet, said he was stepping down from political life. He only became premier in September, and called the snap election in April to seek a mandate after bringing in a tough tax-raising budget. "My contribution to public life is now at an end," Mr Prentice said as he conceded defeat, blaming the collapse in oil prices and the subsequent financial problems. Alberta witnessed a political earthquake last night. The major oil producing province in Canada, it has been the country's major economic engine for several years. However, the precipitous drop in the price of oil created a $7bn hole in the province's finances. Prentice decided to base his campaign on a budget that increased taxes/fees (except for corporations), slightly cut government spending and ran a $5bn deficit. However, this budget angered many Albertans and they responded by electing Notley who campaigned on a very different vision. 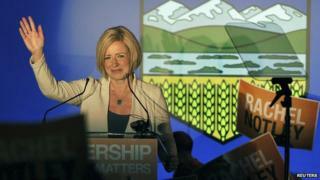 Alberta NDP Leader Rachel Notley called the surprising win "a fresh start for our great province". The result could be seen as a warning to Mr Harper, a Conservative, with a general election looming in October. "I look forward to working with future Premier Notley on issues of importance for Albertans and all Canadians, including creating jobs, economic growth and long-term prosperity across the province and country," Mr Harper said in a statement on Wednesday. The NDP, which has never held more than 16 seats in the 87-seat legislature, looks set to win about 55 seats. The PCs got around 11, behind the newer and even more conservative Wildrose Party. Wildrose leader Brian Jean said his party would serve as the opposition and would keep NDP "on its toes".